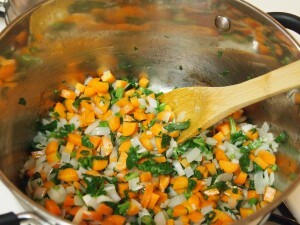 Mirepoix is the aromatic flavor trinity of celery, carrot, and onion used as a base in typical French cuisine. This simple bean soup replaces common celery with the stalks and leaves of its more pungent cousin, celeriac (often called celery root) in the mirepoix. If you are in Austin, Johnson’s Backyard Garden recently started selling this delicious herb at farmers’ markets around town. Saute celeriac, carrots, onion, and garlic in olive oil until the onion is translucent and the carrots are tooth-tender, about 5 minutes. Add the bay leaves, broth, and water, and bring to boil. Reduce heat to low and simmer partially covered for 10-15 minutes. 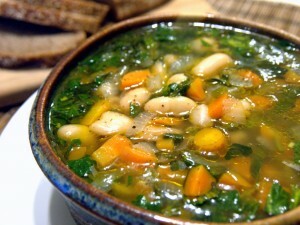 Add the white beans and continue to simmer a few minutes until the beans are warmed. Add the lemon juice, season with salt to taste, and give a few good twists of freshly ground black pepper.